Rock Band 4 was revealed by producer Harmonix as a game for PlayStation 4 and Xbox One with due out later 2015. 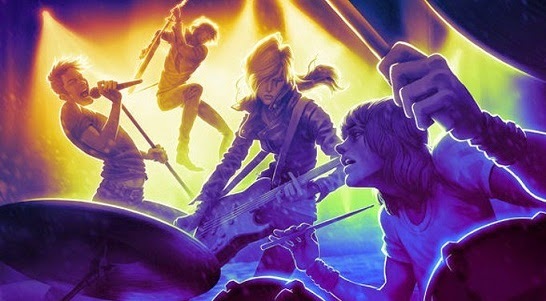 Little information was given about the game itself, but perhaps the most exciting is the confirmation that there will be support for old instruments of games series Rock Band above. Players who had not the old collection of musical instruments can choose a new line of peripherals for Rock Band 4 that will be produced by the manufacturer Mad Catz. In addition to compatibility with instruments, Rock Band 4 will also import all Rock Band 3 content such as songs by DLC. The project manager, Daniel Sussman, commented on some of the changes the team hopes to bring to the fourth chapter. According to him, in previous games of the series you just obey orders on the screen and the team is thinking of ways you can allow players to express their creativity with their own version of the song. He also mentions the impression that the band is made up of four people playing a game single player isolated at the same time, each only with you. Sussman hopes to create a kind of communication, where the drummer pays attention to what the bass player is doing, for example.